YAOUND?, May 27, 2018 (BSS/AFP) - Twenty-two people have been killed in clashes with the army in Cameroon, an opposition MP said Saturday, in the latest violence to hit the restive northwest, where separatists from the English-speaking minority are fighting for greater autonomy. The identity of those killed was not immediately clear, with the army describing them as "terrorists" and villagers saying they were criminals. The clashes come after the US ambassador to Cameroon accused government forces earlier this month of carrying out targeted killings and other abuses in the fight against the independence-seeking militants. "Twenty-two people were killed Friday in Menka during a confrontation... (between the army and) a group of people that were presented as criminals," said Nji Tumasang, a member of the English-speaking opposition Social Democratic Front (SDF) in Santa, the area in which the town of Menka is located. Violence between insurgents and government forces has occurred almost daily in the region since a political crisis escalated in late 2016. An army official confirmed the incident, speaking of "several neutralised terrorists". "A group of terrorists was reported in Menka" and the military intervened to surround the hotel where they were, army spokesman Colonel Didier Badjeck said on Facebook. He added that a "watchman alerted (the occupants of the hotel) which gave rise to long exchanges of fire lasting several minutes". Several weapons and ammunition had been seized, he added. An SDF delegation led by leader John Fru Ndi visited Menka on Saturday, Tumasang said. "The people in the village confirmed that there was an exchange of fire, and some bodies were found in the motel rooms," Tumasang said. "In the village, people do not think they were separatists, but rather criminals", he said. He added that families in Menka had told him that 18 people were also killed on Thursday. The bodies of eight young men had been found, according to witnesses. The presence of a large English-speaking minority -- about a fifth of Cameroon's population of 22 million -- dates back to the colonial period. It was once a German colony and was divided between Britain and France after World War I. In 1960, the French part gained independence, becoming Cameroon, and the following year, the British-ruled Southern Cameroons was amalgamated into it, becoming the Northwest and Southwest Regions. 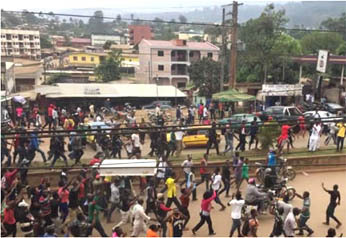 For years, resentment built among anglophones, fostered by perceived marginalisation in education, the judiciary and the economy at the hands of the French-speaking majority. Demands for greater autonomy were rejected by 85-year-old President Paul Biya, in power for more than 35 years, leading to an escalation that saw the declaration of the self-described "Republic of Ambazonia" in October last year.